These adorable matching mommy and me racerback shirts are perfect for you and your little girls this spring/summer. Just in time for mother's day these shirts are perfect for showing that adorable bond between mom and daughter! 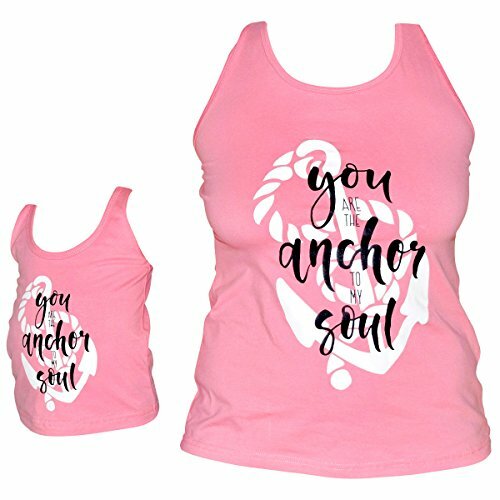 Featuring an anchor design and a cute slogan this is the perfect mother's day gift! Made of a 97% high quality soft cotton and 3% stretchy spandex blend these shirts are soft and comfortable. WHAT KIDS [LOVE]: Comfort and Mom! Kids love the comfort of this adorable shirt and matching with mom will make this mom's AND your little girl's favorite! STYLE [MOMMY & ME]: Mommy and me is in! But it doesn't always need to be so flamboyant! These shirts are casual, comfortable and still adorable! This is the perfect addition to mom and daughter's spring/summer wardrobe! GIFT[ABILITY]: Makes a perfect summer outfit, mother's day present or "just because" gift for your loves. SHIRTS ARE SOLD SEPARATELY! Please add two sizes to cart! Mom Sizes are S, M, L, XL, XXL, XXXL Kid sizes are listed by age.